President of the Republic of Azerbaijan Ilham Aliyev and First Lady Mehriban Aliyeva have viewed conditions created at the newly-built Youth Park in the city of Guba. President of the Republic of Azerbaijan Ilham Aliyev and First Lady Mehriban Aliyeva have attended the opening of the agricultural plant of Gubaekoagrar LLC. The president launched the plant. President of the Republic of Azerbaijan Ilham Aliyev and First Lady Mehriban Aliyeva have attended the opening of “ABAD Factory” Production Complex in Guba. The president and his spouse cut the ribbon symbolizing the opening of the complex, and viewed conditions created there. President of the Republic of Azerbaijan Ilham Aliyev and First Lady Mehriban Aliyeva have viewed the construction progress at the Baku-Guba-Russian Federation State Border toll road, starting from H. Z. Taghiyev settlement, as part of their visit to Guba district. President of the Republic of Azerbaijan Ilham Aliyev has inaugurated the Idrisgishlag-Gasimgishlag-Khaspolad-Zargava-Asparasti-Chaygishlag highway in Guba district. President of the Republic of Azerbaijan Ilham Aliyev and First Lady Mehriban Aliyeva have attended the inauguration of a 100-seat Gunash orphanage-kindergarten in the city of Guba. The president and his wife cut the ribbon symbolizing the opening of the orphanage-kindergarten. President of the Republic of Azerbaijan Ilham Aliyev and First Lady Mehriban Aliyeva have viewed the sapling enterprise of Guba Scientific-Research Institute of Fruit and Tea of the Ministry of Agriculture in Guba. The head of state and his wife then viewed the conditions created at the newly-renovated building of the institute. President of the Republic of Azerbaijan Ilham Aliyev and First Lady Mehriban Aliyeva have attended the inauguration of Guba district central hospital. The president and his wife cut the ribbon symbolizing the opening of the hospital. After viewing the conditions created at the hospital, President Aliyev met with the hospital staff and posed for photographs together with them. President of the Republic of Azerbaijan Ilham Aliyev and first lady Mehriban Aliyeva have viewed the construction progress at Baku-Guba-Russian Federation state border paid highway starting from H .Z. Taghiyev settlement as part of their visit to Guba district, AZERTAC reports. 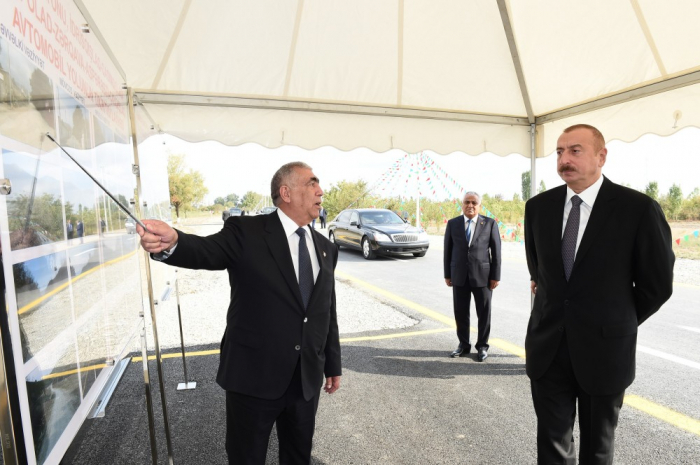 President of the Republic of Azerbaijan Ilham Aliyev has inaugurated the Idrisgishlag-Gasimgishlag-Khaspolad-Zargava-Asparasti-Chaygishlag highway in Guba district, AZERTAC reports. The head of state cut the ribbon symbolizing the opening of the 33 km long road which connects eleven residential areas.